Production of ethnic vegetables is a growing trend on many New York farms. A large assortment of exotic vegetable types while unfamiliar to many Americans may be a taste of home to foreign nationals, immigrants and ethnically-based communities. Most of these ethnic vegetables can be successfully grown in New York. The key to marketing is to select varieties that are familiar to the consumer group. Many immigrants are excited to be able to purchase fresh produce grown locally that would be readily available in their country of origin. 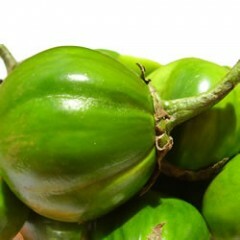 Producing ethnic vegetables can be rewarding, but should be properly researched and tried on a small scale to begin. Interest in growing ethnic vegetables has been increasing in our region. In response, the Cornell Vegetable Program conducted a two-year ethnic vegetable variety and marketing trial. The focus of the trial was to see how well assortments of vegetables that represent some different nationalities perform in WNY under our wildly fluctuating weather conditions and also to see how growers can market these new vegetables, how customers respond to them at the market, and what is needed to reach targeted communities perhaps. Funding was provided by the Western NY CCE Association group. In and around our larger cities and increasingly out in suburban areas, ethnic communities are expanding. This presentation was made to a small farmers' meeting sponsored by the Cornell Vegetable Program, Ontario County CCE, and through funding by GVRMA. The presentation covered discovering what communities are out there, vegetable varieties available, and marketing. Future work will focus on reporting results from variety trials and marketing economics.